The spine is a crucial part of our anatomy in more ways than one. Not only is it the protective structure over the spinal cord, a part of the central nervous system and responsible for delivering messages to and from the brain and our nervous system allowing us to bend and flex muscles and feel with our body, it also gives us the ability to move our torso forward and backwards and twist it left to right. Structurally, our spine is made up of 33 strangely shaped bones, each of which are connected together and cushioned between each other by a disc made of soft cartilage. This cartilage can act to prevent knocking and rubbing together of the vertebrae. However, over time, our spinal column does suffer from degeneration as does most of our body. Endoscopic spine surgery can be used to repair a lot of the damage caused by this degeneration. 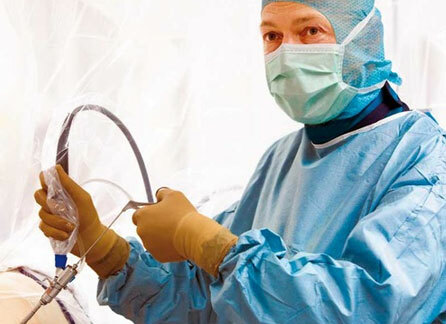 Endoscopic spine surgery is a minimally invasive procedure that is done using a tiny incision. It has many benefits over full open dissection as the recovery time is much quicker and you are back up and carrying on with life in a few days instead of weeks that it might take to recover from the open dissection. The basic process involves repair to the vertebral disc that may be slipped, bulging or generally worn and degraded due to age or because of an injury or accident. When this deformation occurs to the spinal disc, it can pinch and compress on the nerves attached to the spinal column causing a great deal of pain and discomfort, not only to the lower back, but extending to the legs too. Endoscopic spine surgery describes several possible procedures that can help to relieve some of this pressure. For endoscopic spine surgery, the surgeon makes an incision less than 2cm long, and inserts a specially designed tube which separates the muscles as it goes through the various layers to the spine. From here the surgeon can begin the operation which can mean removing a small section of the lamina, which is the arched part of the spinal vertebra, to expose the root underneath. Now the surgeon can begin making room for the tissue to decompress and relieve the pain caused by the disc not functioning properly. Endoscopic spine surgery is cheaper than the open dissection option and is fully supported by the National Health Service so if you do meet the requirements and do need the surgery, you don’t need to stress about the costs involved as they will be covered. There are many benefits for opting for the endoscopic spine surgery least of which is recovery time and less time in the hospital which ultimately means less time spent off work and smaller hospital bills. It is important to remember, however, that endoscopic spine surgery is often a last resort for the relief of pain associated with spinal problems.